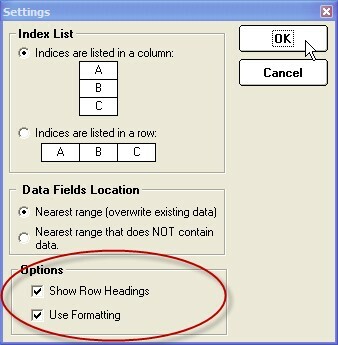 If you select the headings option, headings will automatically be inserted for each selected data field. A bold border will also surround the returned data and headings. Please make sure you leave an empty row above your index list (if indices are listed in a column), or an empty column to the left of your symbol list (if symbols are listed in a row) to ensure there is space for headings. If you select the formatting option, CDXZipStreamTM will automatically format the returned data.